When you sit down to play your first game of League of Legends: Dominion, you might notice that you receive changing, dynamic objectives throughout the course of the match. These objectives are part of the new quest system, and are designed to shake up the flow of combat on the Crystal Scar. While we first introduced the concept of quests in Battle Training, the advent of Dominion afforded us the opportunity to give this feature its debut in player vs. player combat. What Are Quests in Dominion? 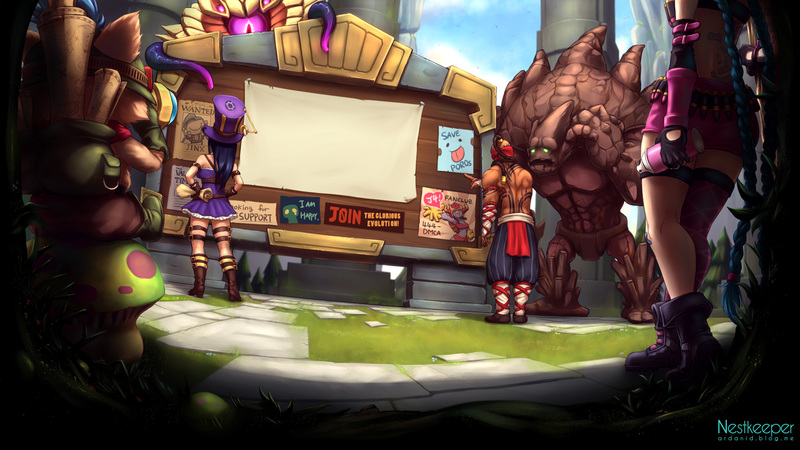 Quests are dynamic, competitive objectives that appear during a game of League of Legends: Dominion to break up the gameplay by changing the strategic value of gameplay objectives. These quests are adversarial in nature and challenge each team to hold one command point while capturing one that is currently held by the enemy team. These two command points will always be adjacent to one another with minions fighting for either side. Completion of a quest awards a team in two ways. For starters, upon completion your team will immediately deal a significant amount of damage to the opposing team’s nexus. You will also be awarded with a significant damage buff not unlike one you might receive for defeating a legendary monster in Classic League of Legends. Much like its Classic counterpart, the buff acquired from a quest can be used to either quickly seize the advantage to close out a game … or to stage a comeback. Why Quests Rather than Legendary Monsters? While the legendary monsters in Classic League of Legends serve their purpose quite well, one of the major objectives of Dominion was to focus gameplay even further toward the player vs. player experience. Also, while a legendary monster such as Baron Nashor or Ebonmaw provides a constant focal point in neutral territory, quests are tied directly in with the strategic objectives on the Crystal Scar. Prevent turtling strategies from becoming dominant. Create an incentive to fight as a team in a gameplay type that encouraged small skirmishes. One of the major objectives of the quest system was to prevent the emergence of a metagame that promoted capturing three command points and turtling to hold them for the remainder of the battle. Turtling strategies like this one are contrary to the high-energy combat that we wanted to promote with the new game mode. So, in order to prevent these sorts of stratagems from emerging in League of Legends: Dominion, we instituted quests to allow us to alter the strategic value of each command point on the fly. Because the quests in League of Legends: Dominion create a head to head competition over two command points, the high strategic value of these particular nodes change. With the added incentive of being able to complete a quest that will deal immediate damage to the opponent’s nexus as well as provide a powerful team buff, a turtling team is forced to rebalance their defensive strategy in order to prevent their opponent from simply seizing this higher value command point and retaking the advantage. In this way, the quest system can turn the standard flow of a game on its head, challenging a team that is set to dig in for a victory to be able to adapt their defensive strategy on the fly, keeping the fighting on the Crystal Scar highly mobile and aggressive. One of the goals of League of Legends: Dominion was to shift the focus away from early game farming, large team fights and long death timers. But while promoting this smaller scale style of combat was one of the major, overall objectives, we didn’t want to completely eliminate the opportunity for players to fight as a team. The challenge, then, became creating the occasional situation in which a team fight would serve the overall objective of outscoring your opponent on the Crystal Scar. When a quest spawns in League of Legends: Dominion, it’s always between two adjacent command points that are held by opposite teams with minions fighting for either side. Because of the high value of defeating your opponent in a head-to-head battle for these two particular command points, players now have a strong incentive to favor these two particular points over the rest of the map. This strategic shift can often be what motivates players to participate in a team battle. 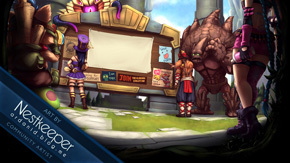 Ultimately, these dynamic quests help to keep the combat on the Crystal Scar flowing smoothly, and preserve the drama and buildup of an epic team fight in the faster paced environment of League of Legends: Dominion. The quest system enabled us to change the central focus of gameplay in Dominion toward these faster-paced, smaller-scale battles without losing any of the elements that made Classic gameplay exciting. Want to hear more from the development staff about designing Dominion? Check out the previous installments of Designing Dominance! People kinda of tired of readin' wall of texts about Dominion and never being able to play it. Edit: Thanks for extendin' the beta test today. Apparently they did. Go to practice games and look for it...its there. Annoying they never said anything though. a new quest! touch the red light to get hp! a new quest! move towards a capture point!